You know the basic laws of supply and demand, right? The more supply of something you have, the harder it is to get rid of and the price therefore goes down. However, the more demand for something you have, the harder it is to obtain and the price therefore goes up. That's why a piece of original comic art is generally more expensive than any comic that it's printed in -- there are thousands of copies of the comic, but only one original. There's a much higher demand than there is a supply. With that in mind, how many of you have noticed this? If you're trying to track down a specific issue for your collection, you will have to pay some not-insignificant amount of money for it. How much of course depends in large part on the rarity of the issue (rarity = low supply). But even if it's a not particularly rare or collectible issue, if you want to get a copy of that one issue from six years ago that your dog tore up last week, you'll probably have to pay at least cover price to get it. Possibly also shipping or an admittance fee to a convention. But, if you're just looking for a pile of comics and you don't especially care what issues, or even titles, they are, you can find a good number of them for free and/or exceptionally low cost. I talked almost a year ago about how I've been able to pick up about seven years of Fantastic Four issues for less than a buck apiece. I was basically just going through back issue bins and pulling out whatever cheap FF's were there. But now that I'm down to a handful of issues, they're harder to find and the more costly they are when I do find them. So far, I still haven't paid more than cover price on any of these, but three bucks for a single issue is considerably more than four for a dollar! So what's interesting to me here is the formula at work. While any specifically cited issue has some value, comics in the broader sense are worthless. I've heard several stories in the past year or two of people trying to unload good sized collections, and getting little to nothing for them. I picked up around 6,000 books for free literally off the curb last year, and passed around 1,000 of those on to a friend's brother. People trying to sell comics in bulk are maybe given a token amount based on the weight of all the comics that are brought in, not unlike if they'd taken a truck full of scrap metal to a recycling facility. And it seems that a number of people don't feel it's worth the bother. A comic, singular, is specific and has value. Comics, plural, is not specific and has no value. Just a fascinating, to me, look at the secondary market for comics. The part of me that acquired an MBA understands all of this, but my teenage self is still having difficulty processing everything. Ah, yes this is an interesting area. I recall years ago, now, going to a convention with a friend of mine. At one point we were digging through bargain boxes with completely random contents. Afterward, he complained that the retailer should organize them. I pointed out that this was directly related to why they were a bargain; in a sense they were just "random comics," and if we wanted anything more specific we had to perform labor to identify it. I had no doubt that if the retailer performed that identification, (most likely) he could have charged more for nearly all of those comics. I'm guessing that he had estimated that the difference would not, however, be enough to compensate for the time invested. My friend wasn't having it, and insisted that no, this was simply laziness. All these years later, I now confess that maybe he had a point. Thinking of a number of your posts in particular, it occurs to me that a lot of comic book retailers are at best very bad at making these kinds of economic calculations, and often probably just indifferent to them. I think the underlying mechanics are still basically valid either way, though. Entropy reduces the price of comics. Whether your friend was right or not, I think, would ultimately depend on what exactly was in those long boxes. Say, for example, if it was nothing but Marvel and DC titles from the past five years, in moderate condition, with no exclusives or signed copies or whatever, it probably wouldn't be worth your time sorting them. 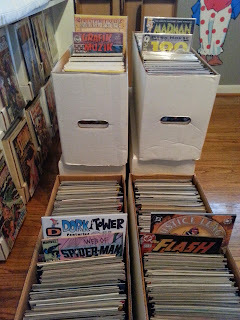 Sure, it would only take maybe an hour or two per long box to sort them, and you could recoup that time (cost) by selling only five or six issues, but then you factor in how long it would take to sell an entire long box that way, the storage costs involved with that length of time, the physical labor of transporting them to/from conventions, etc. I heard Chuck Rozanski say a few years back that he did all the calculations on this once, and figured that any comic that doesn't sell after the first month is worth about ten cents. Yeah, you might sell it for $4-$5 after several years, but after factoring in all those 'hidden' costs, you would've made out just as well if you had in a quarter bin and unloaded it after a month. That being said, if the collection of books you're sorting HAPPENS to have something rare/valuable in it, then you might be able to come out farther ahead because you can price that issue(s) relative to their perceived value. The average issue price would go up, just by the nature of those few, rare issues. Of course, that winds up being a catch-22. 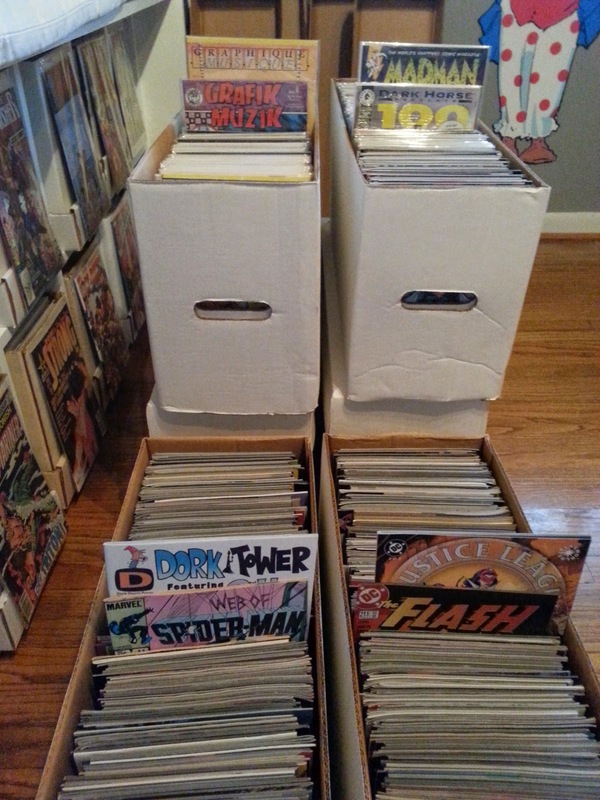 You don't know if you've got anything valuable in any given set of comics without sorting it, but it's not really worth sorting unless there's something valuable there in the first place.